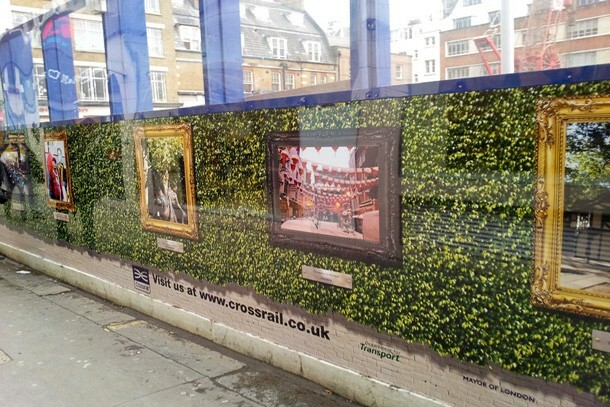 Hoardings get a makeover - Crossrail . For information about the Elizabeth line please visit the Transport for London website. The boundary around Crossrail’s western ticket hall is receiving a makeover. A new design can now be seen on the Dean Street hoarding and the design will soon be carried over onto Great Chapel Street. Selected images from Crossrail’s recent photography competition have been incorporated into the design to show Soho’s colourful community, its people, fashion, businesses, nightlife and its rich history. The make-over has also included replacing parts of the hoarding with transparent panels that allow passers-by the opportunity to watch progress. These new panels allow more light and increase the feeling of space in the walkways around the worksite.